A pipe break in its water distribution system forced EYDAP (the company responsible for the water supply in Attica) to excavate the river bank slope along the Pikrodafni stream in Attica in order to fix the cracked pipe. The water company decided to use our gabions to construct a mass gravity retaining wall, aiming to rehabilitate the excavated slope and protect the pipeline. Minor soil sliding incidents could occur and endanger the pipeline. To avoid hazards, EYDAP’s engineers worked closely with the consultant/designer Gazelas Dimitrios and our Hydraulic Works specialists to find the most suitable solution. It was decided to cover the pipeline and rehabilitate the excavated slope by constructing a mass gravity gabion wall. The gabion wall was designed with our MacSTARS 4 Software. 2x1x1m and 3x1x1m heavily galvanized gabions were used to provide the required river bank stabilization and pipeline protection. We supplied the materials, which were installed by the contractor AD Constructions. A special pneumatic Spenax Tool and Galfan Spenax Rings were used to assemble the gabions faster than traditional lacing techniques. Adjacent panels of mesh were secured together using Spenax Rings which were closed, using the Spenax tool. 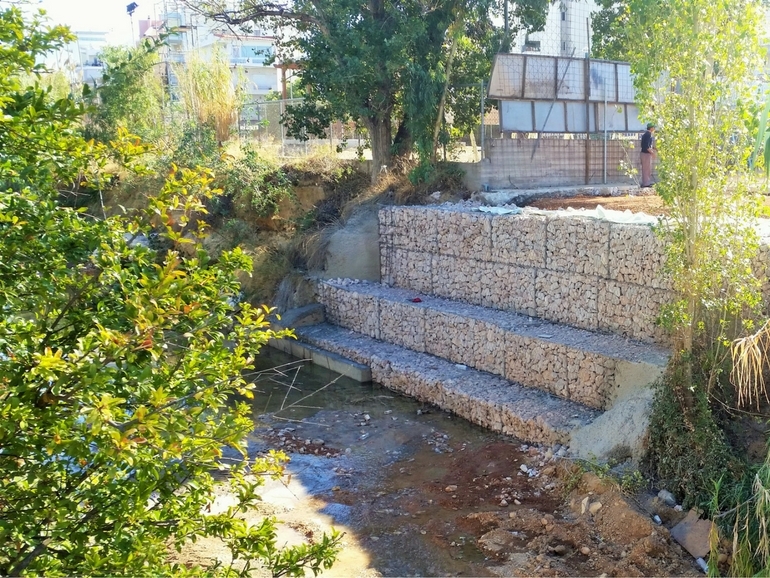 This made the installation easier and faster: in one week’s time the gabions were supplied and the installation of the gabion wall was completed. Our gabions were selected also because they are certified, having CE Certificate for the wire mesh in compliance with ETA (European Technical Approval), as provided by ΕΤΕP 08-02-01-00 Gabions for Slope and Embankment Protection. In addition, we also have CE Certificate for the prefabricated gabions. To learn more about this project, please download our case history . For more information on our gabion wall applications, please contact us.